Success from 3-point range was hard for Phoenix to find last season. NBA.com's John Schuhmann gets you ready for the 2017-18 season with a key stat for each team in the league and shows you why it matters. Today, we look at the Phoenix Suns, who didn't spend as much time beyond the arc as they had in the past. Last season's Phoenix Suns took just 25.5 percent of their shots from 3-point range, down from 30.2 percent the season before. That was the biggest drop-off in a league that took 7,000 more 3-pointers than it ever had. The Suns were one of two teams (Detroit was the other) that ranked in the bottom five in both 3-point percentage and in the percentage of their shots that came from 3-point range. In regard to the latter, the Suns went from above the league average in 2015-16 (28.5 percent) to well below the league average in '16-17 (31.6 percent). With an effective field goal percentage of just 43.9 percent from outside the paint, the Suns were the least effective jump-shooting team in the league. They had the league's worst effective field goal percentage (46.4 percent) on uncontested jumpers and the league's worst mark (33.8 percent) on catch-and-shoot 3-pointers. 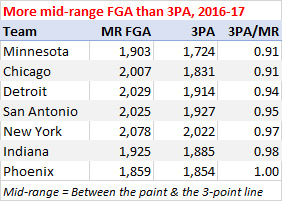 But another part of the problem was that they were one of seven teams that took more mid-range shots than 3-pointers. Though the Suns ranked 27th in 3-point percentage, those 3-pointers were still worth a lot more (1.00 points per attempt) than their mid-range shots (0.76) on average. The lack of 3-pointers can be connected to the lack of ball movement in Phoenix, because *threes are more likely to be off the catch, while mid-range shots are more likely to be off the dribble. The Suns ranked in the bottom 10 in passes per possession and were one of two teams that recorded assists on less than half of their field goals. * Last season, 73 percent of 2-point jump shots were pull-ups, while 74 percent of 3-point attempts were off the catch, according to SportVU tracking. More than two thirds of the jump shots taken by Devin Booker and Eric Bledsoe were off the dribble. The Suns assisted on just 22 percent of their buckets in the clutch (with the score within five in the last five minutes) and their assist/turnover ratio on clutch possessions was a brutal 0.61. Their offense was too often a "my turn, your turn" scenario. Better ball movement would result in more shots off the catch, more threes, and more effective shooting from the outside in Phoenix. Key stats to know about the Phoenix Suns this season. League's worst first quarter team last season, getting outscored by 10.9 points per 100 possessions in the opening 12 minutes. Suns games averaged 55.4 combined free throw attempts, 5.2 more than the average of any other team's games, thanks to Phoenix's rank in free throw rate (third), opponent free throw rate (29th) and pace (second). Have ranked in the top 10 in pace in each of the last 19 seasons and in 30 of the last 32. As noted above, the Suns were one of two teams (Toronto was the other) that recorded assists on less than half of their field goals. They assisted on 49.1 percent of theirs, down from 55.8 percent in 2015-16. That was the league's biggest drop-off in AST/FGM. According to SportVU, they were the team least likely to pass to the screener after a ball screen, doing so just 16 percent of the time. Only team that didn't have a player with an effective field goal percentage better than the league average (51.4 percent) on at least 500 shots. Took 20.4 percent of their shots, the highest rate in the league, in the first six seconds of the shot clock, when their effective field goal percentage was 57.9 percent (21st in the league). Over the last 18 seconds of the shot clock, their effective field goal percentage was a league-worst 46.6 percent. Had five of the 24 players who averaged at least 15 minutes in 40 games or more and recorded assists on less than eight percent of their possessions. Toronto (3) and Oklahoma City (2) were the only other teams with more than one. Have been a worse-than-average defensive team (allowing more points per 100 possessions than the league average) in nine of the last 10 seasons. Have ranked last in opponent 3-point percentage each of the last two seasons and in three of the last five. Last season, they ranked 24th in opponent 3-point percentage from above the break (36.4 percent) and last on corner threes (45.8 percent), with 22 percent of their opponents' threes (the league's fifth highest rate) coming from the corners. Had the league's worst second-half defense last season, allowing 111.5 points per 100 possessions over the third and fourth quarters. Opponents averaged 2.89 passes per possession, the second lowest rate in the league (a hair higher than that of Brooklyn). Lineup of Bledsoe, Booker, T.J. Warren, Marquese Chriss and Alex Len allowed 118.3 points per 100 possessions, the worst mark among the league's 46 lineups that played at least 200 minutes together. It allowed opponents to shoot 46.2 percent from 3-point range, the highest opponent 3-point percentage among that same group of lineups. Scored 107.7 points per 100 possessions in 1,850 minutes with both Bledsoe and Booker on the floor, but just 96.7 in 326 minutes with only Bledsoe on the floor and 101.3 in 880 minutes with only Booker on the floor. Were outscored by 12.1 points per 100 possessions with Brandon Knight on the floor, 11.1 with Len on the floor, and 10.8 with Chriss on the floor. Those were the second, third and fourth worst on-court NetRtg marks among 222 players who averaged at least 20 minutes in 40 or more games. The only players who played more than 15 minutes for the Suns and had a positive plus-minus were Derrick Jones Jr. (plus-33 in 545 minutes) and Alan Williams (plus-2 in 708 minutes). Assist percentage was lowest (they assisted on just 45.5 percent of their field goals) when Knight was on the floor. Their assist rate was highest (54.0 percent) when Jones was on the floor. Dragan Bender was one of three seven footers who played at least 40 games and grabbed less than 10 percent of available rebounds while he was on the floor. Eric Bledsoe shot 25-for-46 (54.3 percent) with the game within three points in the last three minutes, the best mark among players with at least 25 attempts in those situations. Devin Booker's 70 points in Boston on March 24 were the most scored in a game last season, the most since Kobe Bryant scored 81 in 2006, and 31 more than Booker scored in any other game. Booker saw small drops in effective field goal percentage and true shooting percentage from his rookie season. He had the fourth lowest true shooting percentage among 38 players who attempted at least 1,000 shots from the field. 44 percent of Marquese Chriss' 3-point attempts came from the corners. That was the second highest rate among 135 players that attempted at least 200 total threes. According to SportVU, Suns opponents scored 1.19 points per possession when Chriss was the screener's defender on a ball screen last season. That was the highest rate among 99 players who were the screener's defender on at least 500 ball screens. Troy Daniels' 10.8 3-point attempts per 36 minutes led the league last season. He was the only player who played at least 500 minutes and accounted for more than half of his team's 3-pointers while he was on the floor. Tyler Ulis averaged 7.2 assists per 36 minutes, the most among rookies who played at least 500 minutes. T.J. Warren took only 12 percent of his shots from 3-point range, the sixth lowest rate among guards/wings that attempted at least 500 total shots last season (and down from 15.9 percent in 2015-16). His effective field goal percentage and true shooting percentage were both career lows. Alan Williams ranked 10th in offensive rebounding percentage and 11th in defensive rebounding percentage among 294 players who averaged at least 15 minutes in 40 or more games. Only four other players - Andre Drummond, Rudy Gobert, Dwight Howard and DeAndre Jordan - ranked in the top 12 in both. NBA TV's Suns preview premieres at 6 p.m. ET on Monday, Oct. 9. See the full preview schedule here.